Japan has the potential to adopt biotech crops in the future with the increasing importation of biotech maize, soybean, canola, and cotton, which in 2016 was recorded at 20.9 million metric tons. About 90% of these crops were genetically modified (GM). The country leads globally in biotech crop approvals, however, no biotech crop was ever planted. 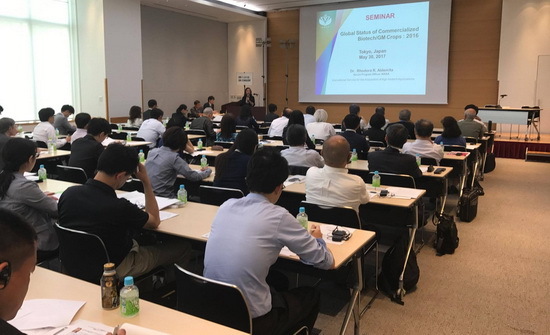 This was put forward by Dr. Fusao Tomita, director of Nippon Biotechnology Information Center (NBIC) during the seminar launch of ISAAA Brief 52, Global Status of Commercialized Biotech/GM Crops: 2016 in Tokyo, Japan. Dr. Tomita opined that Hokkaido farmers are interested in planting biotech sugar beet and consumers should be educated on substantial equivalence of sugar derived from biotech and non-biotech sugar beet. Dr. Rhodora R. Aldemita of ISAAA presented the highlights of the ISAAA Brief 52, emphasizing on the approval of virus resistant biotech papaya for consumption since 2011 in Japan. There is also an ongoing limited planting of biotech carnation and rose in Japan in covered facilities, but no biotech crops are being cultivated. Dr. Yasufumi Iwai and Dr. Yoshihiko Fujimura, both from the Council for Biotechnology Information Japan (CBIJ) gave the opening remarks and the message, respectively. The seminar launch was organized by CBIJ and NBIC with 120 participants, including the media, government representatives, academe, and the industry at Asahi Seminar Hall, Tokyo, Japan on May 30, 2017. For more information, visit the Brief 52 homepage on the ISAAA website. -Published in Crop Biotech Update. See original article link here.